Are you ready to get started living the Vegetarian Lifestyle? I am going to show you how easy, simple, and convenient it is to stop eating meat and start eating a healthy weight loss diet. You’ll even be shocked at how budget friendly vegetarian eating can be! 1) Go to EasyVeggieMealPlans.com and get your free sample meal plan and report on the “10 Vegetarian Foods You Must NOT Eat on a Weight Loss Program. 2) Eliminate meat from your diet and start eating the delicious foods I’ve put together in that meal plan. 3) Watch this youtube video for even more foods to eliminate from your diet and what you should eat instead if you want to lose weight on a vegetarian diet. 4) Visit my blog every week for new vegetarian recipes, meal plans, and eating tips to help you live the Vegetarian Lifestyle! 5) If you have any questions, just let me know! I just wanted to say, thank you so so very much for making this information available. I’ve just started on a live food vegan diet and it’s a big transition to make from the high protein/low fat/low carb way I ate previously. I’ve found it tough to find and make filling vegan food that is heathly and raw, plus kills my insane protein craving, but your tips are so amazing, you’re a real role-model for animal-friendly fitness bunnies like me. Thanks again, eagerly anticipating the next post. If you have a Sam’s Club near you or even a larger grocery store, they will usually have fairly large bags of frozen whole strawberries or blueberries. They are frozen individually then bagged, so you can simply reach in the freezer and grab a handful or however many you need. Fresh is preferred, but frozen is much cheaper where I live and much more convenient for a busy lifestyle with barely enough time to throw a delicious smoothie together. I do not dilute my smoothies with ice. I use frozen blueberries and strawberries, orange juice, apple juice, grape juice, and protein powder. You can modify this as you wish, but you get the idea. I hope this helps! I was wondering about the whole soaking-raw-almonds thing. I tried this once with raw almonds I bought from my local grocer and they got so icky! A coworker suggested that maybe they weren’t raw, just not roasted, as in maybe they were radiated or something. So are they supposed to look all slimey and hairy like that?! 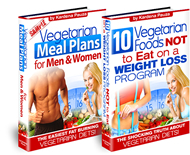 I received the report on the “10 Vegetarian Foods You Must NOT Eat on a Weight Loss Program. However, I did not see the free meal plan in the email email. I did not see where to access the meal plans in the free report sent to me. I am advised by my nutrionist to reduce the amount of soy in my diet as well as gluten. Is there a way to get adequate protein and nutrition from a raw vegan diet that does not include Seitan or tons of tofu? Yes there is. you can get protein from veggies, sprouted grains and nuts and seeds. I have a question, can breakfast and lunch meals be swaped to make it easier to prepare when working? Thank you. Yes you can swap out the 3 major meals. Where can I get a hard copy of your book with recipes etc. in it? And, if I can’t have Gluten is this diet ok for me, or is that cutting out too many food groups? There is very little gluten in this book and easy to work around. There are 100′s of recipes and maybe only 5% have any gluten plus you can interchange the few that do. You’ll really like the diversity. where do you get your raw almonds? There are some local growers here in California and at the farmers markets. I don’t understand why it is so difficult to find you book so I can purchase. We are working on it. You probably went to http://www.easyveggiemealplans.com and tried to order it, right? Sorry for the inconvenience. Check back in just a couple days! this link will get you to the right page. Thanks for being patient. Hi kardena my name is kali and i was wondering if your book easy veggie meal plans for you was sold in stores? No it’s not in book stores. You can purchase it online at http://www.easyveggiemealplans.com. However, try back in a couple of days. Looks like we have a little technical difficulty. Great to have found your informative website. Please can you advise if I sign up for your veggiemealplans (with Kevin Gianni’s smoothie), is this information E-book format or hardback copies? I live in Hong Kong and need to know first whether your great book is able to be sent overseas. My book is an ebook so you can download it instantly. Enjoy! Im an 18 year old pretty but chubby lady and i tried so many things to loss weight..
there are some that works, some are just waste of time and money, but none of them is forever.. i keep gaining weight until i read some tips on your site.. If I don’t follow your recipes as a pure vegan, will I still lose weight? Many of the items I see in the recipes, I have no idea where to buy or I have never heard of them; so I’m improvising. also, I can’t find coconut oil. Is canola oil or olive oil ok as a replacement? Is there a difference? Yes you can still lose weight. You can sub in other similar foods. I believe I answered your question in your other comment about improvising and on oils. You can sub olive oil, flax oil, grapeseed oil or macadamia nut oil. I don’t use canola oil. because approx 90% of canola oil is genetically modified. I am excited about using your meal plan. I have high cholesterol and I need to lose 50 lbs. But I am also frustrated. I’ve been reading through the recipes. 1) I can’t cook during the day at school. I am a teacher and I only get 30 min for lunch without a kitchen. Do you have alternate advice? 2) I don’t know what a lot of the items are, in the recipes. Is there a place on the internet or a book that will explain what some of these items are where I can find them, or what are reasonable substitutes that can easily be found in grocery stores. When starting a new plan, some things will be new to you. This is the same way. Some ingredients you don’t need like maca powder. It’s to help balance hormones especially for women who are experiencing hormonal changes. If it says seeds/nuts- most likely it’s the “Fat/oil” source for that meal. So you can switch out another nut or seed you already have preferably a raw unroasted seed/nuts. All of the items I have in the recipes can easily be found on the internet with explanations of what it is & it’s nain nutritional value. You can always switch out any seasoning, oils can be substituted (olive oil, flax seed oil, macadamia nut oil, grapeseed oil), and beans can be substituted for other beans, almonds can be substituted with other nuts/seeds like sunflower seeds, brazil nuts, etc. Some if not most items can be purchased online also. Several of my clients do this. Thank you. You answered my questions that mostly address my apprehension about jumping into a whole new way of thinking. Your confirmation of substitution helps build my confidence. I’m working on convincing myself that weight loss is secondary to changing my behavior and feeling better. By the way, since I stopped worrying about being perfect to your plan, it is easier and and I do feel better. My last question, at least for awhile, is I really like hummus, black bean soup, black beans and rice, white bean dip, etc. — are beans counter-productive to losing weight? Great, time to get going! Weight loss and beauty start with a balanced body from the inside-out. Think about this- changing your diet to what we know to be a healthier diet is investing in yourself and you future health, longevity, and vibrant quality of life. The alternative is by not investing in healthy foods, education and helpful supplements now, you will be paying way more visits to the doctors office and investing in his retirement fund and lining his pockets. And feeling miserable and sick along the way. I know you choose to be healthy, vibrant and fit. The weigth loss will come jsut look at the overall picture also. You can definitely lose weight when eating beans. My diet consists of a lot of raw foods, however I do eat cooked beans sometimes and I love hummus. During my training for my competition I had some beans in my diet, WHILE losing weight and getting down to 10% body fat. I have PCOS and all of the books recommend a low-carb, high protein diet to combat this and it’s symptoms. I am not a big meat eater and prefer to not eat it. Have you had anyone successful on your plan with PCOS? When I’m doing the 21 day detox. It states 4oz of fruit juice. I’m thinking you mean freshly squeezed oranges? I’m sorry if you have mentioned this somewhere. Also have you ever thought of doing a e book in Australian metric? I will consider putting it in metrics. Thanks for the suggestion! Let me know how it goes on the detox! Do you have a list printed some place of staple spices and pantry items that I should have on hand to make the recipes in your book? I am also interested in alternatives to fresh veggies. For example — what can I get frozen or canned that will work in the recipes even when they call for fresh. I am thowing out a lot of food and I just can’t get to the produce market everyday. Thanks. Hi Katie, I don’t have a list of staple items but it’s a great idea so I’m working on that and I’ll let you know when I have it completed! About buying frozen or canned veggies. 1st I would say get frozen vs canned whenever you can. The order of most nutritious is fresh, frozen, then canned. So first go for frozen veggies. You can get quite a few veggies frozen. We buy frozen veggies for emergencies in case we run out of fresh ones, we have frozen spinach, broccoli, green beans. There’s a lot of variety so stock up!